Astrologers are like cosmic detectives, always looking for the edge when it comes to insight about events. Astrology has a number of ways to discern results, whether personal or national. The most common is to look at the transits, or energy patterns, that the planets are currently making to a birth chart, which holds the blueprint of energy for the person or nation. The United States of America actually has no clearly known birth time, so astrologers have their pick of several times during July 4th, 1776, for the moment when the Founders began to sign the Declaration of Independence, thus initiating the process which gave birth to the nation. 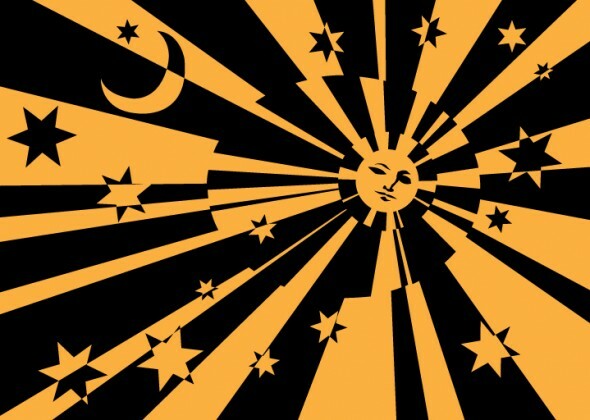 The current favorite is what’s called the Sibley chart, set for 5:10 pm, Philadelphia, PA.
We are a Moon-child nation, born under the sign of Cancer. Home, family and tradition play important roles in American life. With its Cancerian, Water Sign sensitivity, Mom, apple pie and the girl you left behind have been prominent themes. Our personal (and social) security are important. It’s a bit of a contradiction because we were born of revolution (Uranus, signifying just that, is here situated near the horizon). Pluto (power) in Capricorn in the 2nd House of money speaks to the economic engine of America being so great as well as the concentration of wealth among the elite (called plutocrats, after all). Jupiter, bestower of blessings, sits next to Venus (love/money/pleasure) in Cancer, reiterating the theme of a nation blessed with an abundance of resources and love of family. Saturn (accomplishment) sits in Libra, sign of social justice, high in the 10th House of reputation—designating a nation committed to law and destined to lead. Neptune, the energy of dreams and ideals, not to mention religion, sits equally high in the chart, in Virgo, sign of applied knowledge, in the 9th House of spirituality and international affairs. America takes its religion seriously (at least at election time) and moral issues are always at the fore in public debates. Neptune can, however, also mean illusions, and America’s vision regarding the rest of the world has lately left much to be desired. Mars (energy, aggression) in the US chart is in Gemini, giving us a tendency toward diversity in thought, word and deed but with a relatively short attention span. Mars in the same sign as Uranus also speaks, for good or ill, to the importance many place on being armed. So what’s happening now in the USA chart and which political candidate best fits the energies at work? Here are the transits (outer wheel) displayed for Election Night, set for the time when the polls close on the West Coast. The astrology says there is a possibility of snafus which could delay the election results. Mercury, the planet associated with communications and transportation, turns retrograde at 5:57 pm EST. This is a big red flag that things may not run as smoothly as we might hope. What could it mean for the election? A retrograde means that the past is important, that energy turns backward. This would favor the incumbent, President Obama. But it could also mean delays in counting votes due to unexpected factors. There may be trouble with voting machines. After all, the last time Mercury was retrograde on Election Day (turning direct that very day) was the year 2000…and we all remember what happened then. Should we expect more hanging chads? It’s possible. Hurricane Sandy also fits the astrology. But don’t discount another controversy arising, such as one candidate winning the popular vote and the other winning the electoral college. There are factors, though, which give us clues as to the winner. 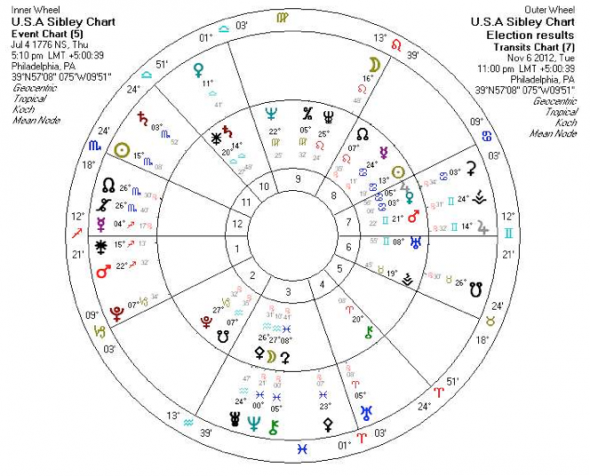 On Election Night, the Moon (emotional connection) is in Leo, President Obama’s Sun-sign—giving him some extra oomph. Venus (affection) is close to the USA’s Saturn (the past) in Scorpio, in the 11th House of community. This is generally a sign of continuity. 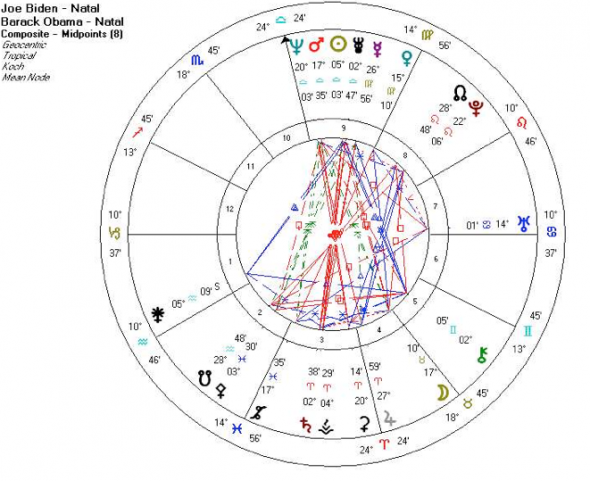 Mars (anger) sits in an exact square (tough, 90-degree angle) to the USA’s Neptune (ideals)—a sign of weariness, confusion and perhaps an inability to accept the election results. Expect the winner to issue a call for healing. There are several strong factors in Romney’s chart that say he is a force to be reckoned with at this time. The transiting Sun is just moving off from an exact trine (flowing angle) to his Mercury, which means his message is heard. The transiting North Node, or life destiny point, has just crossed his Moon-Jupiter conjunction in Scorpio. This gives a great boost to his chances, but it is also just moving off. It peaks before Election Day. Uranus, the sudden change agent, is within three degrees of an exact sextile (opportunity angle) to his natal Venus, creating much affection and excitement in his life. Jupiter (good fortune and expansion) is in his 1st House (personality) in a close square to Mercury (communications). The classic interpretation is exaggeration and “malarkey,” but in any case he is being listened to. However, a couple of harsh energies may do Romney in. The first is Saturn (accomplishments) transiting in a tough square to its own position in his birth chart. This is reality check time—a clear sign of loss, not gain. Neptune (dreams/illusions) is also transiting in a square to his Ascendant (image), which speaks to a lack of actual substance. Neptune is barely moving and will make its turn from retrograde to direct motion on November 11th, indicating a change of direction of his personal dreams. What jumps out here is the transit of Neptune, making its station November 11th at zero degrees Pisces, precisely on the composite chart’s Sun and Ascendant. Technically, Neptune has moved back by a few minutes of arc into the 12th House, which one could interpret as loss after much media glamour. The phrase “smoke and mirrors” comes to mind. Neptune breeds intrigue and charisma, but makes it difficult to discern substance. It’s also in a hard square to the Midheaven, the point of reputation. What appears solid may be insubstantial instead. 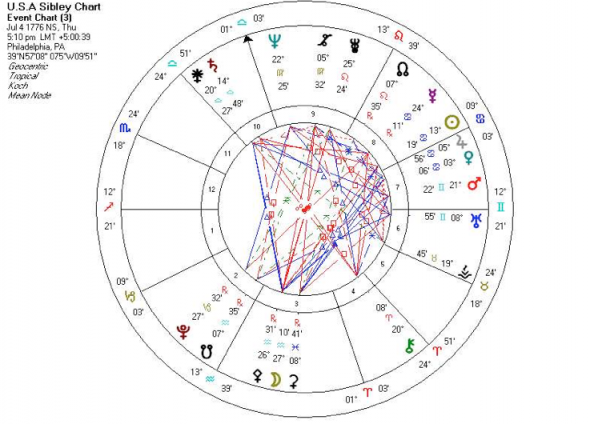 Saturn, Mr. “Get Real” Himself, is approaching the composite chart’s Neptune, which looks like cold water being dumped on Team Romney’s dreams. Benevolent Jupiter is retrograding out of its fortunate conjunction to the chart’s Saturn, which is like getting that hot girl to say yes to a date and then getting acne. Still, Jupiter is nicely aligned with the chart’s Mercury, emphasizing good news of some sort, and there is a rare Yod aspect—called the “Finger of God” because it indicates something fated—involving the chart’s Saturn (achievement), Pluto (power) and transiting Uranus (sudden change). The transiting North Node (destiny point) is also close to the chart’s Midheaven (angle of elevated status). It’s entirely conceivable that Romney and Ryan could win the popular vote, or come close, and lose the electoral college. So what about President Barack Obama? Let’s look at his transits. 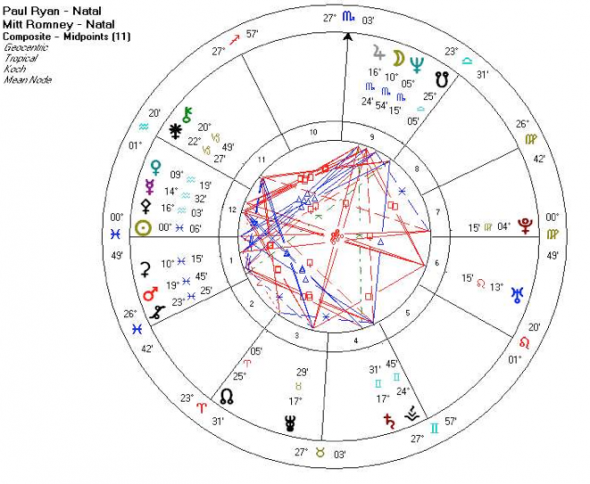 The transiting Sun is moving away from a tough square to his natal Sun, indicating an improvement from the last few days before the election. The transiting Moon revs up Leo, his Sun-sign. 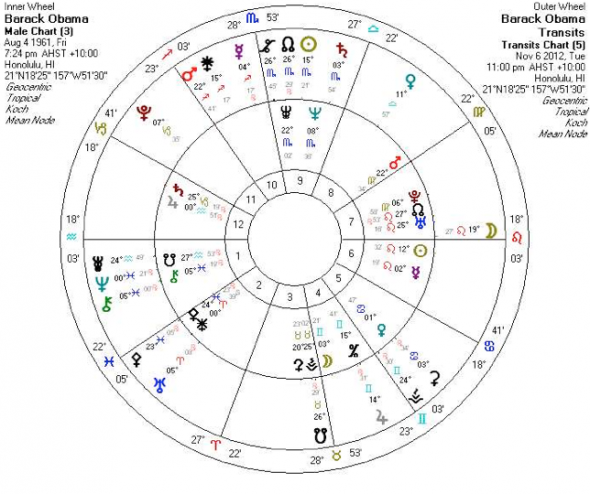 Obama’s mood is light…and made lighter by the fortunate angle of Venus (harmony and love) in justice-loving Libra to his Sun in Leo (leadership). Jupiter, giver of grace, is within two degrees, in mid-Gemini, of a sextile (opportunity angle) to his Sun, and moving backwards toward the exact angle. If we do not know the results on Election Night, this is an indication of him winning in a week or two. Saturn (achievement) is moving past a harsh square to Mercury (communications), so the hard times begin to fade just as the election arrives. Neptune (ideals) floats harmoniously in a trine to the president’s Moon (moods), another indicator of happiness. Pluto (transformational power) also sits in a flowing trine to its natal position, a self-empowerment aspect. The transiting North Node (destiny point) is near the Midheaven (point of status), but also in a square to Uranus (the unexpected), so nothing is guaranteed until all the votes are counted. Transiting Mars is also precisely square his natal Mars on Election Night, an indicator of perhaps having to bring out his political boxing gloves one more time. Finally, we find that the president is in his Chiron Return, an every-fifty-years aspect of crisis, regeneration and healing. Taken together, Barack Obama’s astrological aspects seem to indicate a winner. Not an easy winner, but a victor nonetheless. Can we get a final confirmation from his composite chart with Joe Biden? 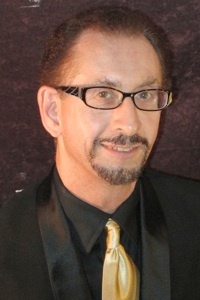 The transiting Sun is illuminating the team’s 10th House of status and reputation, and on November 6th forms an exact flowing trine to Uranus (innovation) in the 7th House of partnerships. That’s a big yes to political victory. The Moon on November 6th moves through the composite chart’s 7th and 8th Houses of shared connections, and by early morning is close to a conjunction with Pluto (power). That’s another favorable sign. Transiting Venus (harmony) is that day also on the precise midpoint between Team Obama’s Sun (self-identity) and Mars (desire for action). That’s a soft, warm pillow for their political head. 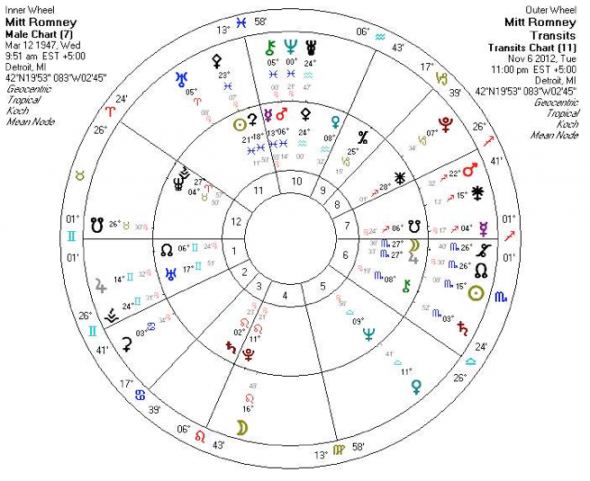 But it’s not all honeydripping goodness, as the transiting Moon (emotions) makes a tough square to the chart’s Moon, indicating some major mood swings during the day, and maybe from the electorate as well. As if that weren’t enough, transiting Uranus (liberation or chaos) is precisely opposite the composite chart’s Sun. This could be the constraints being removed or the wheels coming off, but taken together with other positive factors, I am seeing it as reelection and a major new political direction. Barring an upset brought about by weather conditions, hanging chads or rigged voting machines, energies indicate that we will have Barack Obama as our president for four more years. Hopefully they will be less divisive and much more inspiring. Like a ship caught in a hurricane, America is undergoing much buffeting right now, and I don’t mean from Warren Buffet. It is simply a volatile period, and America has an important role to play in leading the way toward a more prosperous and peaceful world. This election is part of that process. It’s as if the heavens are putting pressure on us to see if we can transcend our differences, our illusions, our attachment to the past. If we don’t, the pressure gets more intense. The world needs a strong, but clear-minded and open-hearted America. Astrology gives us a language, a spiritual vocabulary, to be able to understand the energies at work. Those energies right now say to look forward, not back. We shall see if the electorate agrees. Perhaps they should listen to their astrologers!